One of the biggest hesitations when changing to a new mailbox is leaving behind all your old data. You never know when you may need an old email, and it’s reassuring to know that your data isn’t lost. Gmail has an option to import any emails and contacts from your old account to be sure nothing is lost during your transition. Once inside your Gmail account, select the Settings in the upper right corner and click on the Accounts and Import tab. Google will take you through the steps to import all your mail and contacts by clicking the Import Mail and Contacts button at the top. Once you’ve imported all your emails from your old mailbox to Gmail’s, it’s a good idea to keep Gmail fetching mail from that account for about month or so. 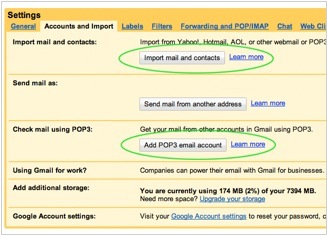 Under the same tab, there’s an option to Add POP3 Email Account so that Google can import any new emails that still get routed to your old address. This way, you can notify any contacts that you may have forgotten to update your information with your new email address. Open Outlook and select your first calendar. Click File, Save As, and enter the name of that calendar. You can edit the date range and detail level by clicking More Options. It’s probably best to include full details and a maximum date rate to make Google Calendar an identical match to your Outlook calendar. Once you’ve chosen the correct advanced options, click OK and then Save. This will create a .CVS file format that can be imported into Google Calendar. Repeat these steps for each of your calendars within Outlook. account and select Calendar in the upper left corner. Select Settings in the upper right and choose the Calendars tab. There will already be a default calendar, usually titled by your name. You can ignore this calendar, or put it to use (I ignore it since it cannot be deleted). Select the Create New Calendar button and enter a calendar name. Fill in any other information and select the Create Calendar button on the bottom or top. Do this for each Outlook calendar you’ve exported earlier. When the number of new calendars matches the number of Outlook calendars, select Import Calendar under the Calendars settings tab. Choose the file of one of your exported Outlook calendars and select the calendar name in the dropdown menu beneath it. Select Import and repeat for each calendar. Once you’ve finished moving all your calendars onto your Google account, you’ll need to download Google Calendar Sync to allow for two-way syncing between Google Calendar and Outlook. Click here to download it, install it, and enter your Google account information when prompted. 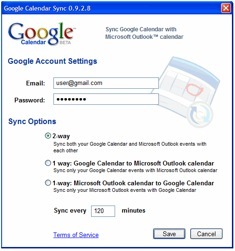 Select the 2-way sync option to allow a change made from Outlook or Google Calendar to be reflected in the other. It will add an icon to your system tray that allows you sync calendars by right clicking. Open iCal and select the first calendar. Click File, Export, and enter the name of the calendar. This will create a .ICS file format that Google can import into Google Calendar. Repeat these steps for each of your calendars in iCal. this calendar, or put it to use (I ignore it since it cannot be deleted). Select the Create New Calendar button and enter a calendar name. Fill in any other information and select the Create Calendar button on the bottom or top. Do this for each iCal calendar you’ve exported earlier. When the number of new calendars matches the number of iCal calendars, select Import Calendar under the Calendars settings tab. Choose the file of one of your exported calendars and select the calendar name in the dropdown menu beneath it. Select Import and repeat for each calendar. Once you’ve moved all your iCal calendars onto your Google account, go back to iCal and select Preferences from the iCal menu bar. 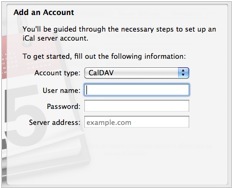 Choose the Accounts tab and click the + at the bottom and select CalDAV from the Account Type dropdown. Enter your Gmail account information and add this URL in the Server Options box: https://www.google.com/calendar/dav/[email protected]/user. Replace [email protected] with your Gmail address. Click Create. Still in iCal Preferences, select the Delegation tab and choose which calendars you want to add into iCal. Once you see all your Google Calendar events added into iCal, scan through and check that your old calendars match up to Google’s. Once you’re sure, you can delete your old calendars from iCal. Any changes made in iCal or Google Calendar will be reflected in the other. Select File and choose Import and Export. Click Export to a File and click Next. Choose Comma Separated Values and Next. In the folder list, choose the Contacts Folder and click Next. Save the file, and it should produce a .CSV formatted file. Name it, select Next then Finish. Log back into Gmail and click Contacts on the left menu bar. Click Import on the top right and click the Choose File button. Select the file you saved from Outlook and click Import. Keeping your contacts between the two synced is not built into Outlook, so you’re going to have to look elsewhere for this feature. Just remember to make changes to both when you update one, or make the change in Outlook and repeat the export/import process to update your contacts in Gmail. If you’ve got any suggestions for software workarounds, share them in the comments. It’s fastest to manually export your contacts to a file and import into Gmail. Download AddressBook2CSV Exporter. Install the file, run it and follow the two instructions in the application. It takes about 30 seconds in all and it’s by far the easiest route. Once you’ve imported your contacts, go to Address Book preferences in the menu bar and select the box next to Synchronize with Google. Add your account info, and changes made in either should show up in the other. These changes aren’t immediate, which is why I recommended importing your contacts to Gmail. So there you have it — a fairly straightforward way to move all your data into the Google cloud. If you’re still hesitant, share your thoughts in the comments. If you can make any of these steps easier, be sure to let us know.